While it's not Pokemon-killer, Yo-kai Watch delivers a delightfully simple and engaging experience that'll keep you coming back time and again. At first glance, Yo-kai Watch can look intimidating. It opens with a premise foreign to many players outside Japan (those ‘yo-kai’ can defy English description at the best of times), introduces you to over two-hundred new creatures with their own strengths and weaknesses, then drops you into battle and wishes you good luck. But don't let those tricks fool you - in practice it's deceptively simple, light, and so easy to play you can do it without trying (and sometimes even looking at the screen). It doesn't offer much for players looking for something strategic and demanding, or as involved as its closest analog, Pokemon. But what it does offer is a game delightful in its simplicity, breezy and sweet. 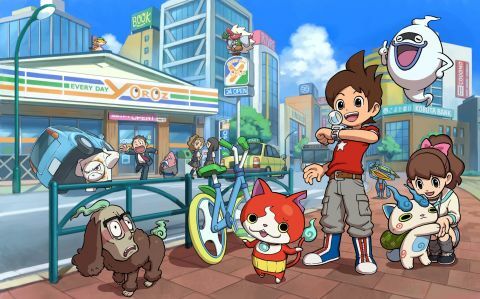 In Yo-kai Watch, you play as a young kid who stumbles on a magical timekeeping device (one guess what it's called), which allows you to see and interact with supernatural beings making mischief around your hometown - think My Neighbor Totoro rather than Ghostbusters. That's as deep as the story goes, and you'll spend the majority of your time solving slice-of-life mysteries through the city of Springdale (deeply Japanese in everything but name) and 'befriending' new yo-kai with no greater aim in mind. That leaves the game with little to offer players looking for an involved plot, and those uninterested in the trappings of childhood will want to look elsewhere; between its school-days story, focus on friendship over competition, and unabashed teaching moments (you'll actually be punished for using a crosswalk without hitting the signal), this is Nintendo's most child-focused game in years, and that's saying something. But far from being a detriment, that tone adds to Yo-kai Watch's unique charm: the soft-watercolor world of Springdale is a joy to explore with your marshmallow-y yo-kai partner bobbing at your heels, and the variety of low-key tasks you can do (playing hide-and-seek with sneaky spirits, running errands for your neighbors, spending a day at the catfish pond) make for a nice and relaxing bit of playtime. The whole experience is wrapped up by a delightful soundtrack that highlights just how lighthearted your time in Springdale is meant to be, and traipsing around town with that in the background is a near-instant stress-killer. And even if children are the target audience, there's still plenty for adults to enjoy here - the English translation maintains much of the original Japanese game's puntastic humor and fourth wall breakage, all ridiculously delightful even when they make you groan. As many yo-kai as there are hiding in Springdale, there are perhaps even more tasty treats that you have to sort through on your adventures. While food always helps boost your yo-kai team's health or special-move energy, giving food to an enemy yo-kai can make them like you and increase your chances of befriending them. Unfortunately, the game doesn't tell you which yo-kai like which food, and the the answer is only occasionally intuitive. You have to experiment to see what food works with what yo-kai, which can hurt when something delicious you paid out the nose for does nothing. The main body of the gameplay - battling wild yo-kai - is similarly low-key. In fact, your input isn't actually necessary - the yo-kai fight each other without any input from you. Instead, you're relegated to team management, using a circular roster wheel to trade yo-kai between your active and on-deck parties, as well as 'purifying' sick creatures and doling out buffs as needed. A clever twist on the standard monster-hunting formula, it allows you to focus on something other than dry damage-dealing, and strikes a fine balance between keeping your yo-kai in fighting form and putting your best party forward without feeling overrun. Admittedly, the results can be underwhelming if you're looking for something strategic, since there isn't much to the average battle - I was able to put down the game without pausing to answer the door, and the yo-kai won without any help from me. However, boss battles offer a major exception to that rule, demanding your constant attention and forcing you to think carefully about the best way to care for and guide your yo-kai into doing what you want. This is where Yo-kai Watch is at its most successful and clever: frequent enough to keep cerebral players satisfied but not so common that they make the game stressful, Yo-kai Watch's boss battles really are the best of both worlds, making the experience feel whole. Unfortunately, the trade-off is a lack of true control over your yo-kai team, which can make battles feel frustrating and arbitrary - for instance, the game mentions that certain yo-kai are strong or weak against other yo-kai, but fails to actually explain which is which, leaving you in the dark. This is most aggravating when it comes to 'befriending' new yo-kai - you have to guess what sort of food a given yo-kai might like and give it to them as a gift while trying to hold back your party from killing them, and you aren't always going to be quick enough. That ends up being quite a pain, and gathering all the yo-kai can feel like an exercise in futility as a result. But if you're willing to set aside dreams of completionism, that becomes far less of a problem, and the yo-kai you do manage to befriend feel a lot more special. Yo-kai Watch isn't the kind of game that will take over your life. As much as there is to do and see, there isn't much depth to the experience as its monster-hunting contemporaries offer, and it's better suited to short play-sessions on the train to hours-long deep dives. But good games come in a thousand forms, and Yo-kai Watch doesn't have to be a life-stealer (or a Pokemon-killer) to be delightful. It's the kind of game you'll come back to over and over again for another quick jaunt through that sweet and easygoing world. And maybe you'll finally befriend that weird dog with the man-face this time. Description A Monster-befriending adventure where only you can see them.